Monday, December 01, 2008 Posted by Stephanie H.
Fire has been around since the beginning of mankind, but the outdoor fireplaces in which the fire is contained have progressed a long way from just a shallow hole in the ground. It is all about function and presentation. 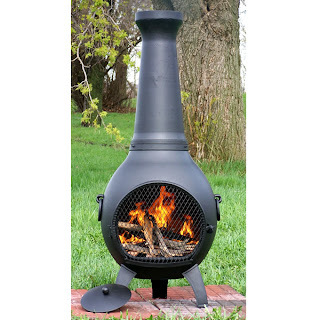 One great product that has actually been around for hundreds of years, is a chiminea. These pot-bellied free standing outdoor units were designed to protect the fire from rain. The original chimineas were traditionally made of clay because it was readily available and inexpensive to produce. The clay chimineas can still be found, but the longer life span of aluminum, cast iron, and even copper make these the materials of choice for today. The chiminea was originally used near a window for indoor heating and cooking. Currently chimineas are primarily used outdoors in a backyard setting for entertainment purposes. They are an enjoyable focal point when socializing on chilly evenings. With its bulbous style and lofty smoke stack, the chiminea is the most unique of all the outdoor fireplaces. It usually radiates heat from one side of the unit only. Also available are more contemporary designs for those who do not care for the traditional look, and even a few styles that can radiate heat all around. When choosing a chiminea, consider what is most important to you. Keep in mind that the easiest of the chimineas to maintain are the cast aluminum units. They look better longer, are low maintenance, and weigh considerably less than the cast iron units.